Unlike the work of some artists who deal in abstraction, Robert Kelly’s meticulous compositions are deeply rooted in the stuff of the real world. The formidable paintings—“formal puzzles,” he has called them—mix line and color with vague remnants of text. In “Black on Bone,” a selection of his commanding work is now on display at Sophia Contemporary, marking the American artist’s first London solo show. Although Kelly has been based in New York since the late 1970s, he originally hails from Santa Fe, and the desert hues haven’t disappeared from his palette. After completing his studies in 1978, he did a stint as a commercial photographer for Polaroid before embarking on his own artistic career in 1982. His influences range from art historical—including movements such as Russian Constructivism, De Stijl, and Bauhaus—to the likes of Jean Arp, Richard Diebenkorn, and Ellsworth Kelly. Everyday objects fascinate Kelly as well, particularly the printed matter he collects on his travels around the world. Many of his paintings begin with a richly textured assortment of these various scraps, which include antique botanical drawings, sketches, posters, and handwritten notes. On wet canvas, Kelly arranges moistened strips of the found ephemera, creating a collage of irregular gridded patterns—“exquisite junctions and disjunctions,” he has called them. He then applies thick layers of oil and gouache, building up his distinctive, tactile surfaces and geometric forms. Along with a deep, void-like black, the palette includes shades of yellow, ochre, and red, as well as titular bone. Given the textual foundation of his work, the pale hue also recalls musty pages of old paper. 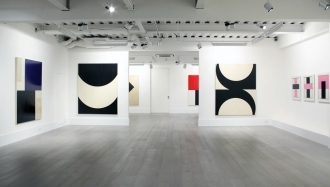 “Robert Kelly: Black on Bone—Selected Works” is on view at Sophia Contemporary, London, Sep. 28–Oct. 28, 2016.